Random acts of artistic kindness in our local Australian communities inspired by the US Art Abandonment movement in response to the Sydney siege. Artists and other creative well-wishers leave anonymous tokens of goodwill in public places for the enjoyment of their local communities. P-plate Project: pots 4 people, pets & plants. 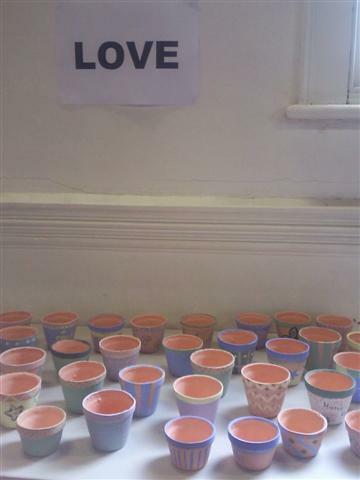 P-plate Project: pots 4 people, pets & plants is a group of clay-loving mess makers who meet each week to create ceramics for family, friends, pets and plants. P-plate Project is a community arts-based project created by Irene Charnas in collaboration with Ultimo Community Centre. COWBelles Community Art & Craft. COWBelles Community Art & Craft is a group of art & craft enthusiasts meeting in a warm supportive environment. COWBelles Community Art & Craft is the community arts-based networking opportunity created by Irene Charnas in collaboration with Ultimo Community Centre.